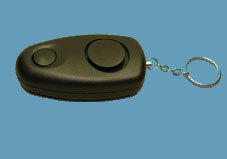 Compact Keychain Style Alarm (carry in hand, attach to purse or backpack), best used by people at risk entering or leaving their automobiles or homes. The 120 Decibel alarm is activated by pulling the metal ring to remove pin. Ideal for shift workers who work until late in the evenings, or for use in parking garages and underground parking structures. Can be used as a flashlight without activating the alarm.